Brighter days ahead? Spot-on prognosis? In Search of the Three Buddhas In and out of the Bermuda Triangle Breaking out of the Bermuda Triangle Getting out of the woods What ails the KLCI? 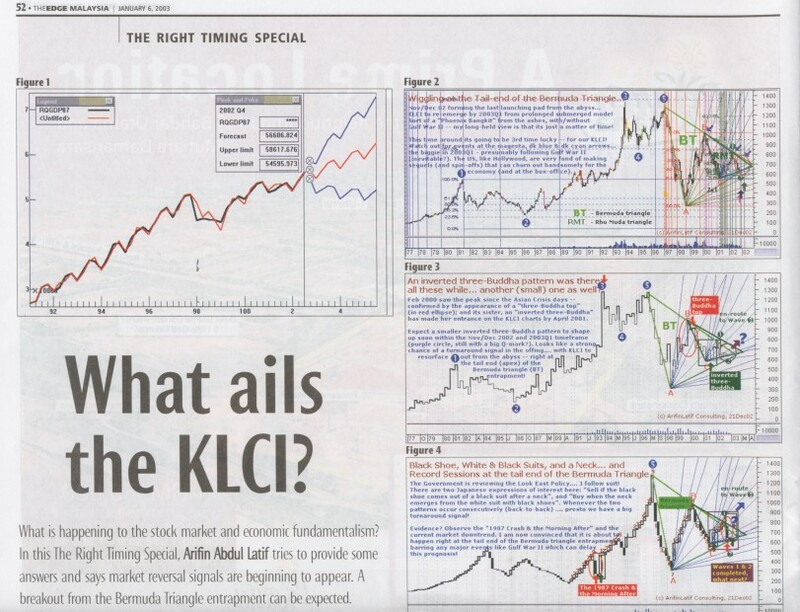 The EDGE Malaysia, 26 Jan 2003 - "The Right Timing Special: What ails the KLCI?" . The EDGE, 3 Sep 2001 - "The Right Timing Special: Breaking out of the Bermuda Triangle"
The EDGE, 30 Apr 2001 - "The Right Timing Special: In and out of the Bermuda Triangle"
Buletin Wawasan (INTAN), 2000 - " Where is the End of the KLCI Slide -- In Search for the Elusive Three-Buddhas"
Buletin Wawasan (INTAN), 1999 - "Brighter Days Ahead Revisited"
Buletin Wawasan (INTAN), 1998 - "The Malaysian Stock Market, Economy and the Ringgit -- Which Way Now?" Buletin Pengurusan & Pentadbiran (INTAN), 1996 - "Prices of Plantation Stocks, Major Commodities and the Malaysian Economy -- Which is the Leading Indicator?"